For the last few years, the NBA 2K series has taken great care to show reverence and respect for the sport's past, highlighting the greatest accomplishments and players to set foot on the hardwood. It began with NBA 2K11, which brought Michael Jordan to the forefront. Then NBA 2K12 gave us legendary match-ups to play, replete with historical presentation cues and visual fidelity. Then NBA 2K13 gave us ... Jay-Z. This year, NBA 2K14 tries something a little different. By attaching LeBron James, NBA 2K14 attempts to look forward and provide fans with an outlet to predict the future of today's greatest basketball player. 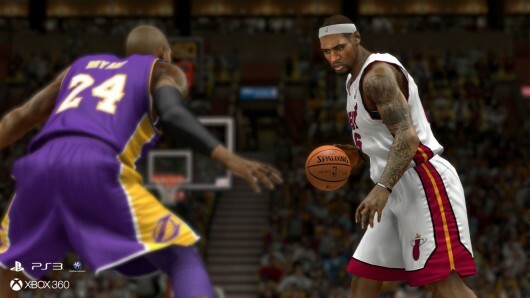 NBA 2K14 review: Swear fealty to King James originally appeared on Joystiq on Fri, 27 Sep 2013 10:45:00 EST. Please see our terms for use of feeds. A game called Wreckateer has been spotted in the Australian ratings classification system, listed as being developed by Iron Galaxy and published by Microsoft. Iron Galaxy Studios is a company that's done a lot of technical consulting for other game developers -- it recently helped Capcom bring Street Fighter 3: Third Strike Online to digital platforms, not to mention work on You Don't Know Jack. According to its webpage, Iron Galaxy is also working on some yet-to-be-announced projects with Microsoft and Twisted Pixel, and it appears as though Wreckateer is at least one of those projects. That's all we know about the game thus far, other than that it's an original title, and it's been rated General for all audiences. Wreckateer, whatever it is, was just classified this week, so presumably we'll be hearing more about it soon. Iron Galaxy Studios' Wreckateer leaked in ratings, to be published by Microsoft originally appeared on Joystiq on Thu, 19 Jan 2012 08:00:00 EST. Please see our terms for use of feeds. Another month, another leader board... Just an aside, if you're cheating the system just to get on this list, please stop. * means comments are enabled! Go leave a message! Winner's Rewards: Bragging Rights and the Top 5 Get first access to the 2012 Viral Badge. Attention GoW3 Brotherhood Challenge winners: Payment processing has begun! US winners will start receiving checks after the Thanksgiving holiday, and participants from other countries will start receiving them in the weeks following. Please be patient, we have almost everyone's contact info. Congratulations and thank you to all who participated in this great event. Okay, this is my reimagined definition of Badges 2.0. Starting, well, yesterday the genre badges are now stacking international games. This means that if you played a regional variation of MagnaCarta2, you will get credited for the highest score gained for that game across all regions for the JRPG genre. We've started with the JRPG and WRPG genres first, so not all games are entered(this takes time). There will be thread in the forums to post the game and genre that you need updated if you want to get moved up. The Badge Calculator has been updated to handle these calculations and indicate which games are stacked. Also you can see the lists on the menu Badges/Genre badge Lists: http://360voice.gamerdna.com/genre-view.asp. But wait, there's more! As some of you may know, I've been running rudimentary leader boards for genres on my Badge Calculator for a few years now. Also, this will show your calculated score as on 360voice. These have now been brought onto 360voice proper, so check them out under menu Leaders/Genres: http://360voice.gamerdna.com/leader-genre.asp. So, please spread the word, especially to your European friends. Well, October has come and gone. Sadly pTartTX has beaten me by a mere 4% of the votes. Apparently I didn't poll well in Michigan and Georgia, although by my count I won the Electoral College. 360voice Community Member Planting42 was so inspired by one of our events here at 360voice, he decided to take what he learned about community events over to TrueAchievements (where I have also been on staff as a Newshound for the past 21 months). The Great TrueAchievement Score Challenge was born as a result, and needless to say, it was a success. This year's event promises to be bigger and better. Information about the GTASC 2012 is available on our own forum right here, so that you can put together a team of five and show TA just how 360voice rolls. Streaks are on, if you don't play today, you won't have a badge tomorrow. The problems we had earlier this month regarding the data feed from Microsoft have returned. As a result, you may show a negative gamerscore gain, achievements may not process, games may not show as being played and your gamerscore may not show the full increase. To help alleviate these issues, we have turned off streaks for now and so you will not lose a play or score streak as a result of this issue. The problem with a negative score causing you to be kicked from a gamerscore challenge has also been corrected. You will remain in the challenge but it will show a negative gain for the day. We apologize for the inconvieance and are anixiously awaiting a fix for the issue from Microsoft. Thank you for your patience.